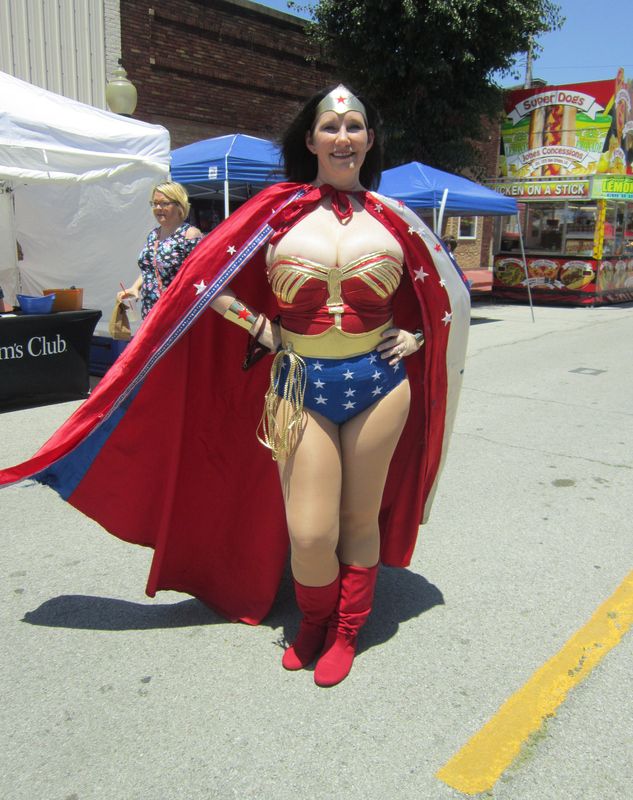 Superman Celebration 2017 Photos, Part 2 of 4: Cosplay! « Midlife Crisis Crossover! 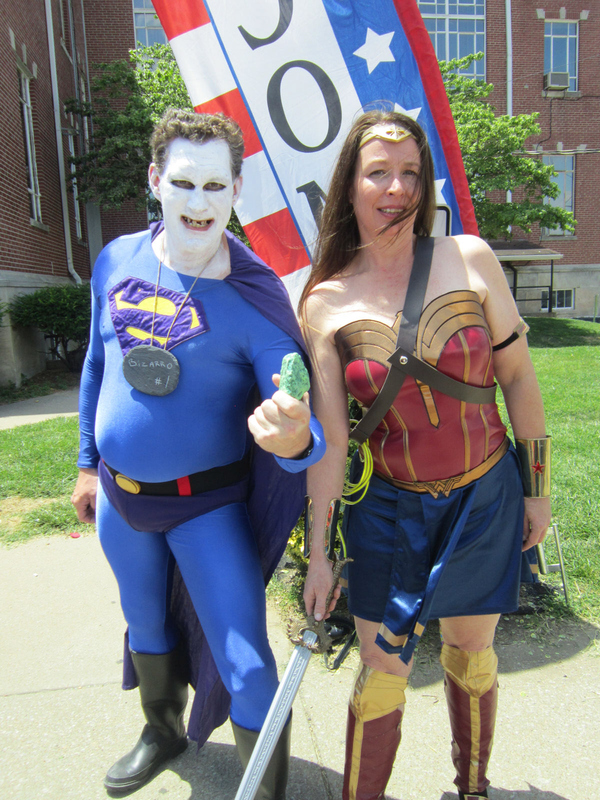 Superman Celebration 2017 Photos, Part 2 of 4: Cosplay! 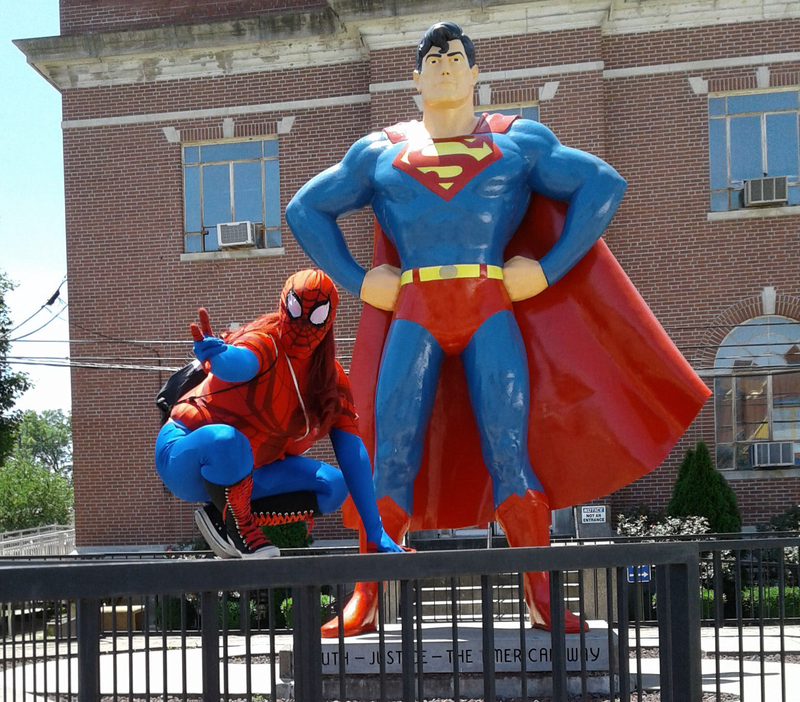 Spider-Gal, Spider-Gal / Does whatever a spider shall / Spins a web, catches creeps / Strikes a pose, plays for keeps! 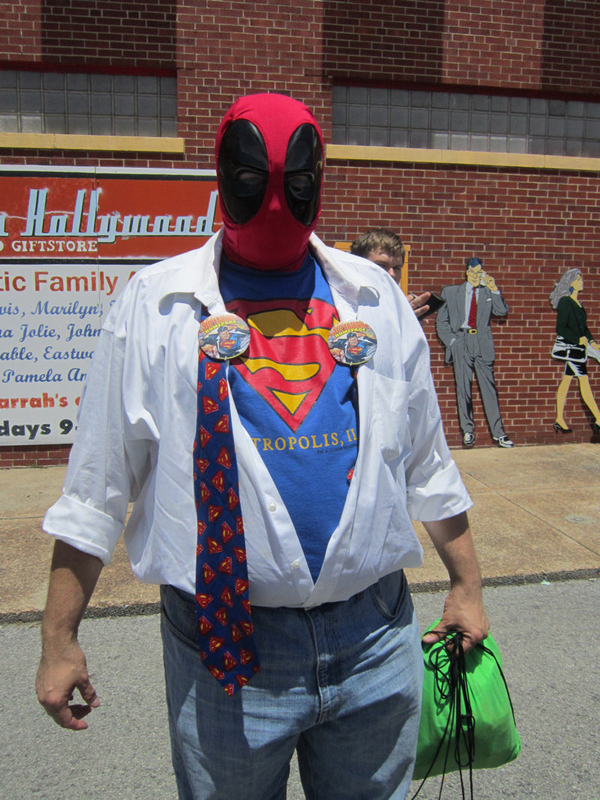 Previously on Midlife Crisis Crossover: on June 9th and 10th my wife Anne and I attended the 39th annual Superman Celebration in Metropolis, IL, a grand bash in honor of the Man of Steel in particular and all the super-heroes who owe their existence and livelihoods to him in general. And of course there were costumes! 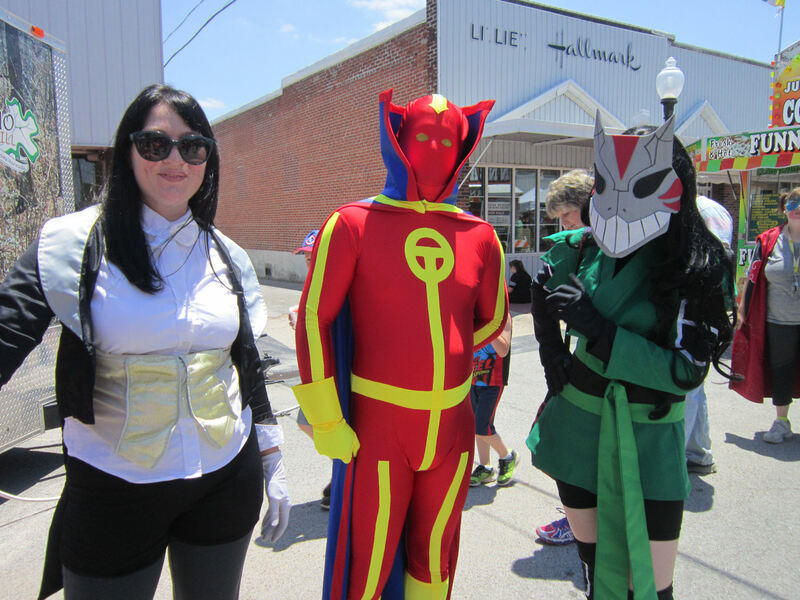 Lots of cosplayers spiffing up the town with their favorite characters from the worlds of comics, film, TV, animation, and toy stores. I’ll shut up now and let the photo gallery roll! 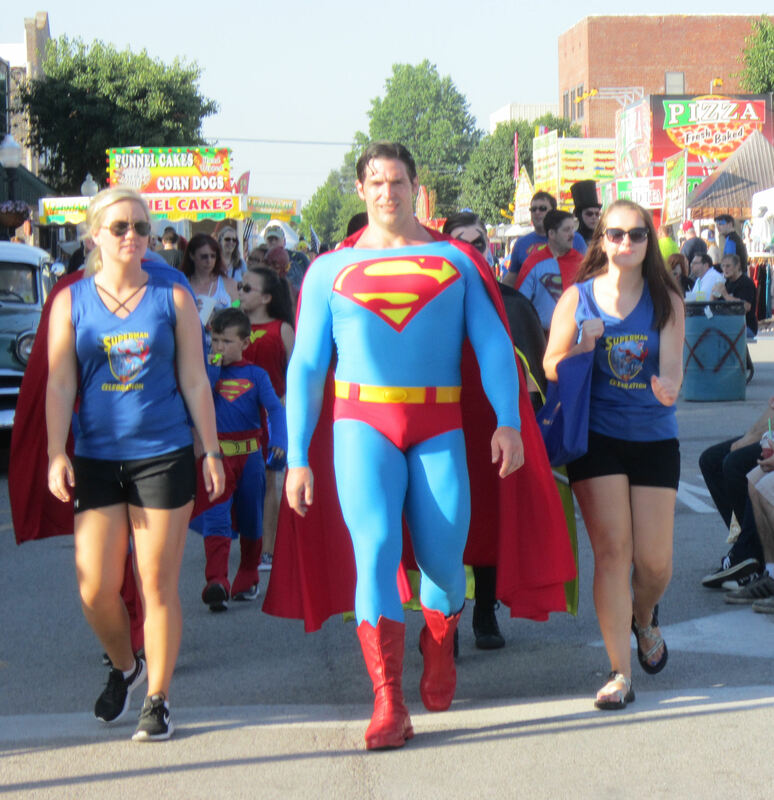 Of course Superman was there. 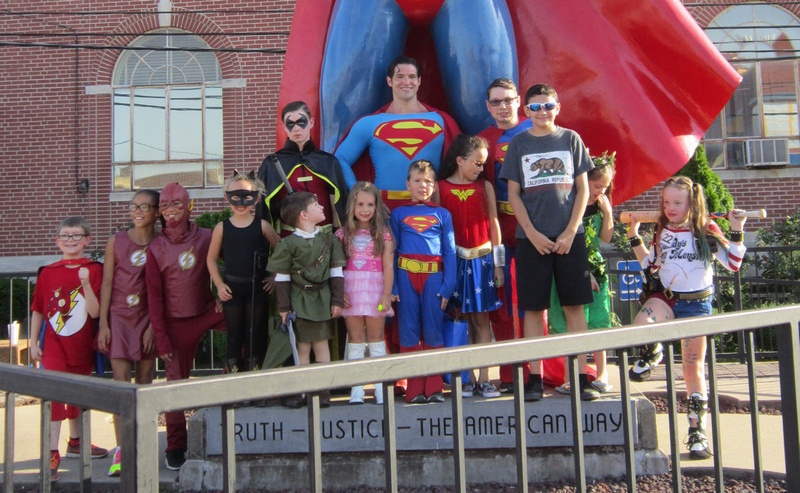 On Friday he led a kids’ costume parade from the north end of Market Street to the Superman statue, noisemakers at full volume all the way. The parade’s big finale: a group statue rendezvous. 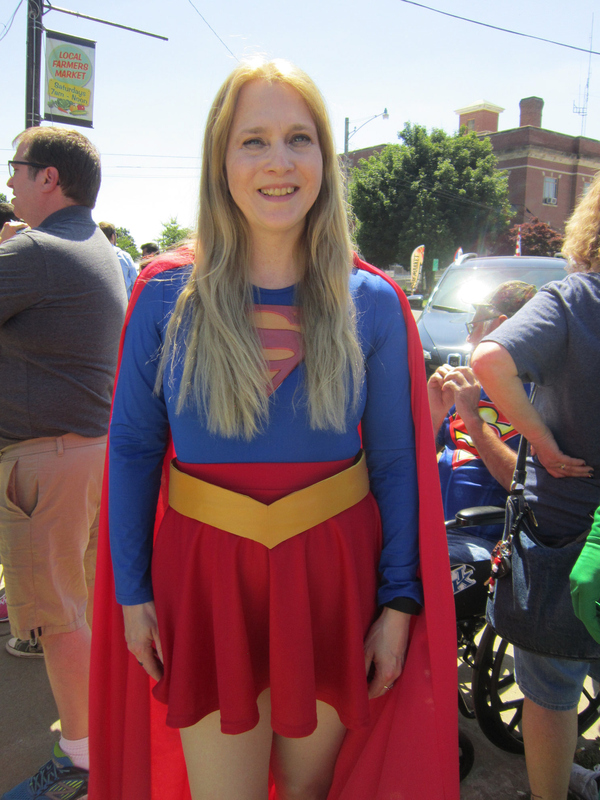 Of course Supergirl was in town to mark the occasion and say hi to her cousin and whatnot. 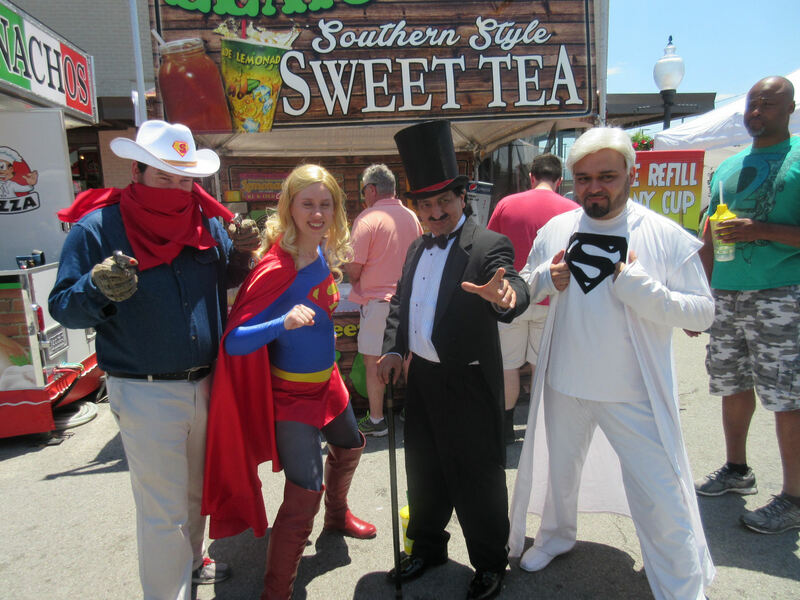 Another Supergirl hanging out with Vigilante (Golden Age version), the Wizard (old-time DC villain), and Marlon Brando’s Jor-El. Wonder Woman representation was increased manifold this year. Her movie’s now in theaters. You might’ve heard of it. It’s a big deal. 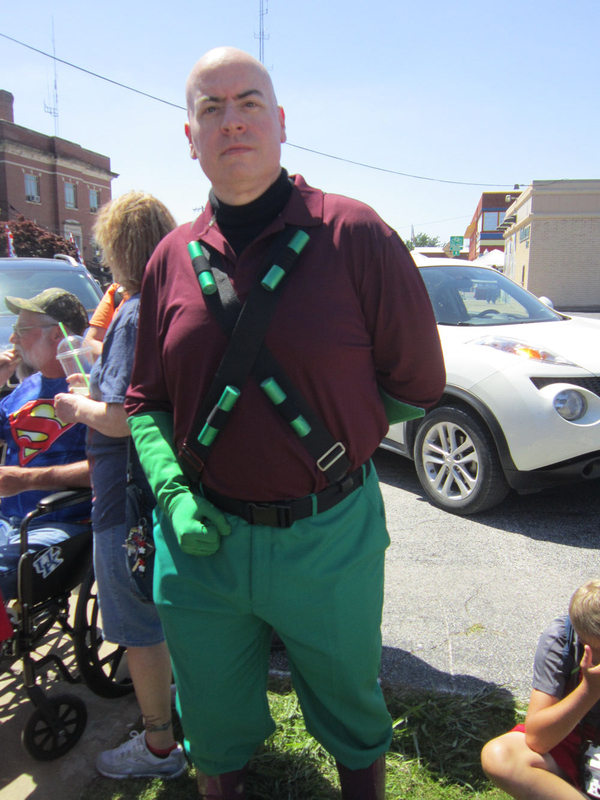 When we’re talking Superman villains, it wouldn’t be a complete lineup without Lex Luthor. 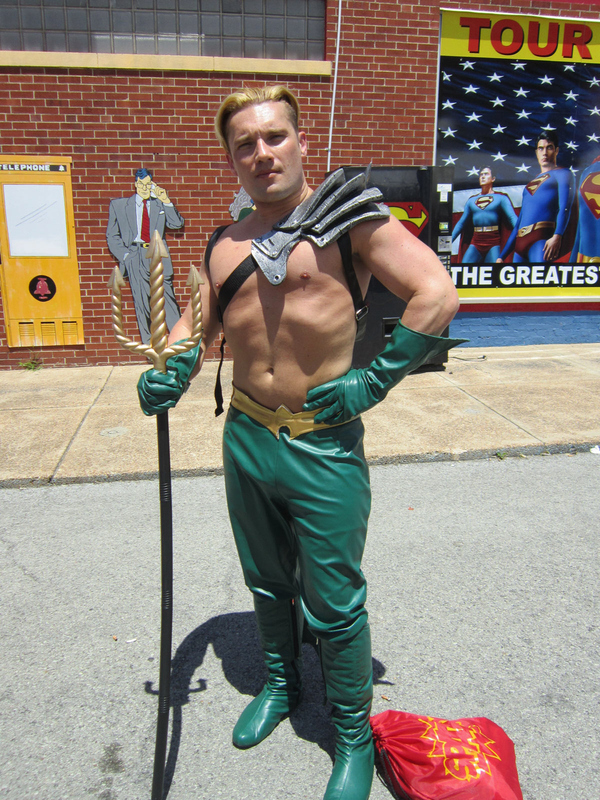 Aquaman bides his time, waiting for his big chance to become America’s Next Top DC Hero. SOON. Guaranteed not to hassle Aquaman in his film: his evil twin Nuclear Man from Superman IV: The Quest for Peace. It wouldn’t be a gathering of comics fans without at least one Deadpool variant. Filling that critical quota is not-so-mild-mannered Clark Kentpool. Daily Planet staff meeting! 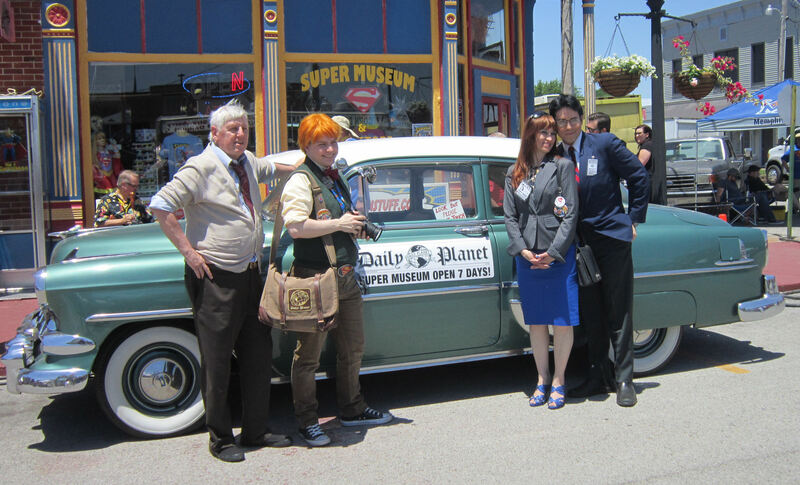 Perry, Jimmy, Lois and Clark hang out by an old-timey car in front of the Super Museum. 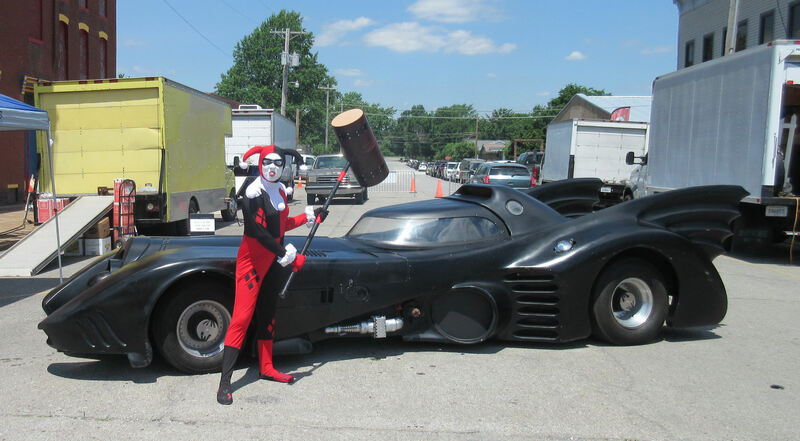 Also from the automotive department: Harley Quinn crosses the media to smash Tim Burton’s Batmobile to bits. 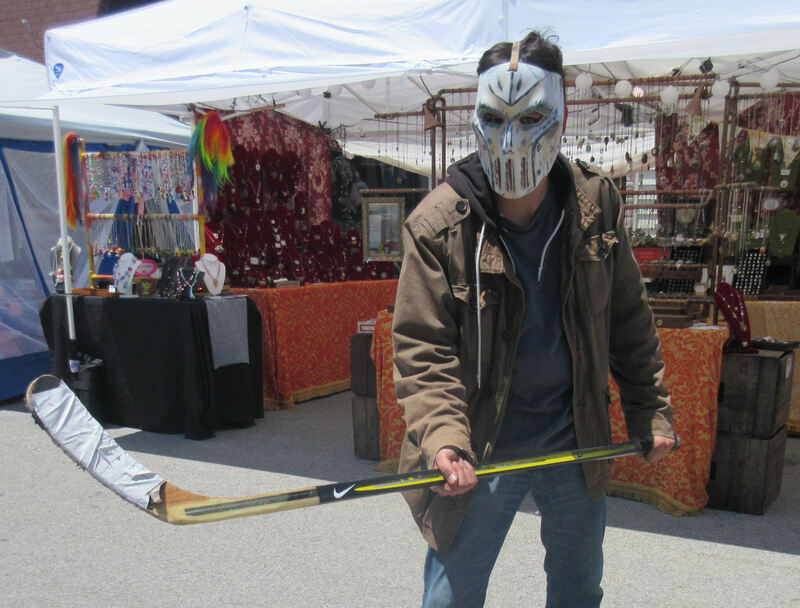 Also speaking loudly and carrying a big stick: Casey Jones on patrol, Turtles or no Turtles. The JLA’s heroic android Red Tornado flanked by new versions of Zatanna and Cheshire from the Young Justice animated series. A very special Teen Titans/Marvel Family team-up! 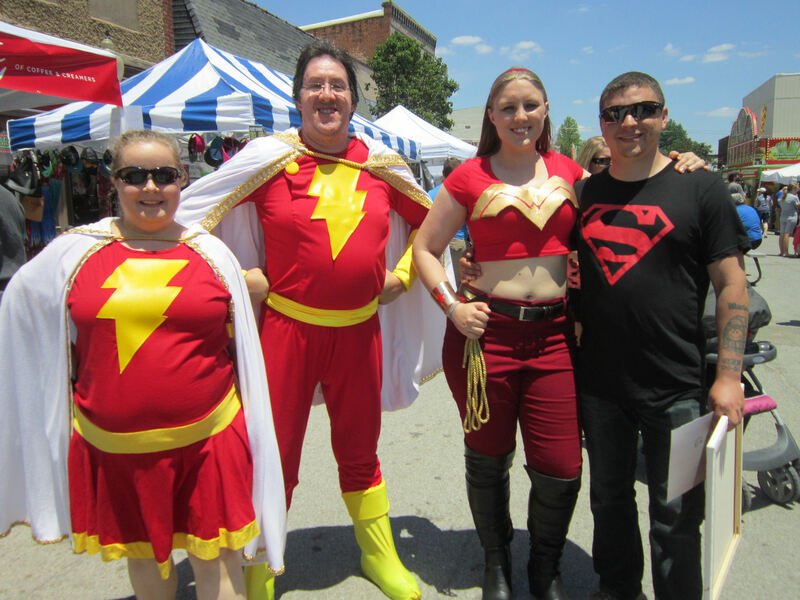 Mary Marvel, Captain Marvel, Wonder Girl and Superboy. 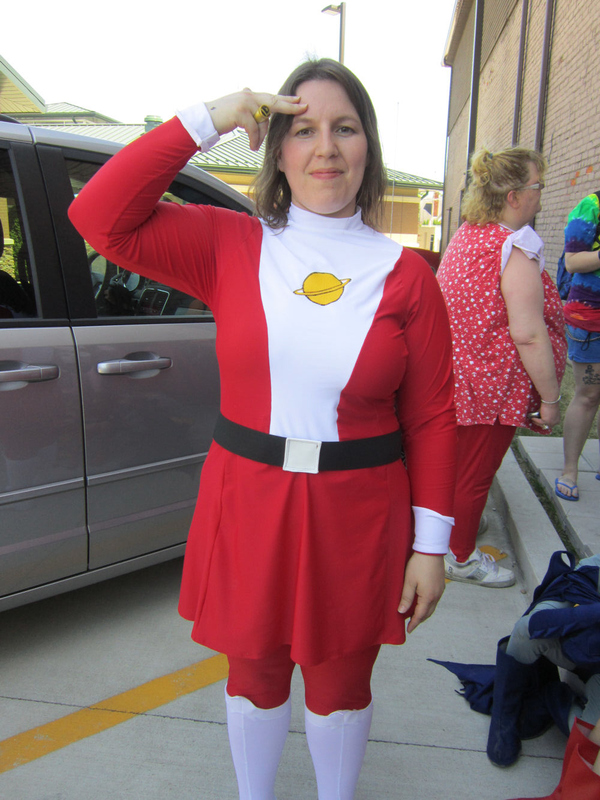 Saturn Girl, founding member of the Legion of Super-Heroes, brings greetings from the 30th and/or 31st centuries. Originally the Shade was a straightforward Golden Age DC villain, but fans of the wondrous James Robinson/Tony Harris 1990s Starman series recall his complicated life rather differently. 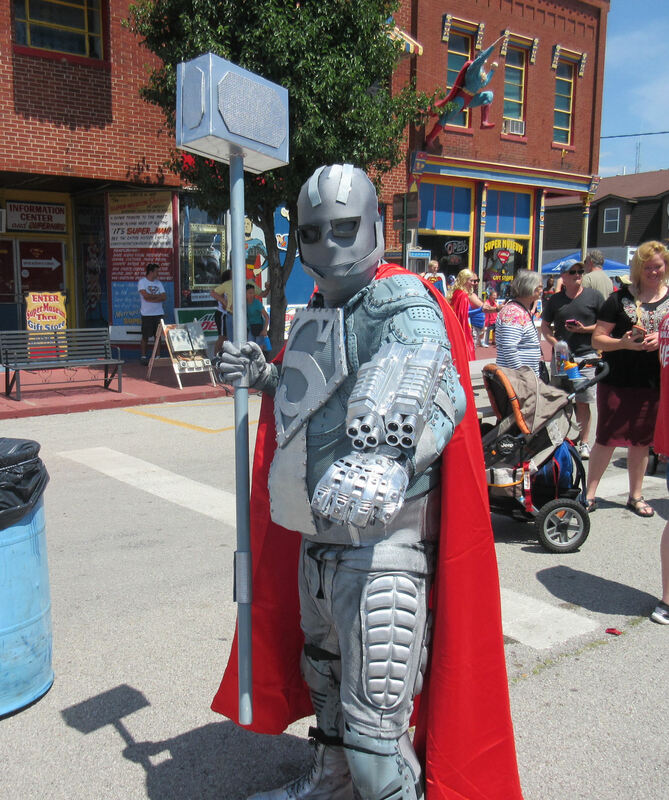 The most elaborate costume we saw this weekend: John Henry Irons IS Steel. Fun science fact to keep in mind: whereas your average convention cosplayer spends most of their time indoors and surrounded by air conditioning that helps counter all the body heat milling around them and inside their costumes, all of these fine folks were cosplaying outdoors in summertime in temperatures pushing 90 degrees, some for hours at a time. Their dedication and stamina are impressive and enviable and I hope other fans brought them lots and lots of water. 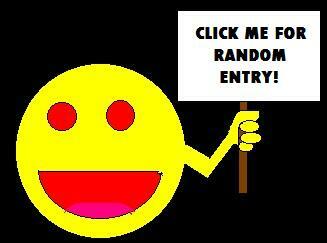 Part 4: Who else we met, what else we did! 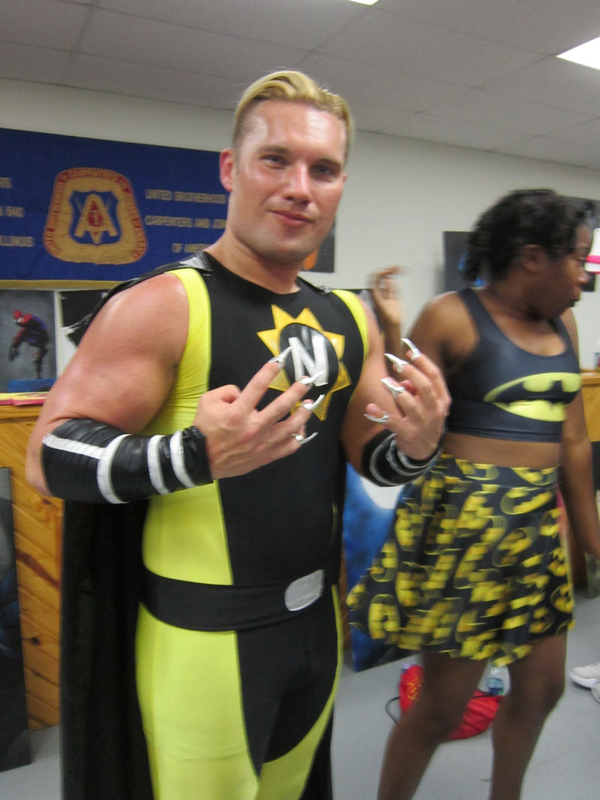 « Superman Celebration 2017 Photos, Part 1 of 4: All-Stars!